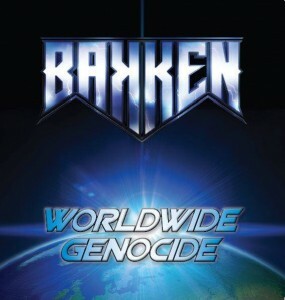 BÄKKEN‘s previous debut album, “Death Of A Hero”, from 2012 was one of my top picks from that year. I literally couldn’t get enough of it and played it to death. They weren’t trying to break any moulds or reinvent anything. They simply played honest, straight-up heavy metal with enough passion to rival their very obvious influences. Maybe it was because it was spread over an entire album that made it work with most of the individual tracks focusing on a different idol to pay tribute to. But it certainly worked well and made you sit up and take notice. Unfortunately! I don’t think the band have managed to pull that off on this new “Worldwide Genocide” EP. In particular, the EP harks back to the glory days of MEGADETH‘s “Countdown To Extinction”. And while the tracks are excellently written, and in some ways more advanced than before, the sheer amount of MEGADETH and METALLICA permeating through on this EP is palpable. Fair enough! They are two of the most influential metal bands on the planet. But they have been aped and copied by countless others already. So it begs the question! Why would BÄKKEN purposely go down that route. Simon Pickett has always had that Hetfield/Mustaine style to his vocals anyway, but on these tracks with the music being so close to the mark also, it just cuts way too close. Definitely something he should really try and knock on the head for future releases. The band are still rock solid players and there’s certainly no disputing that fact. But I had hoped they would try and expand on their sound rather than focus on one particular aspect of it. Maybe it’s something they need to get out of their system before moving forward. Hopefully that’s the case!